Dione VIII Earrings. These stunning earrings were named after one of the Greek Nereides or sea goddesses – Dione (The Divine). 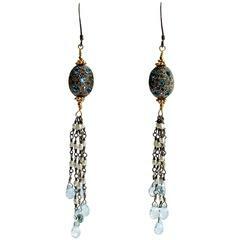 Reminiscent of the ocean – Luxe harlequin faceted London blue topaz baguettes are capped with a foamy froth of dainty moonstone and freshwater seed pearls. This gift from the sea, suspended from beautiful 24K gold vermeil filigree post earrings will certainly make you feel divine! 1.5 inches long from post X approximately .75 inches wide at clusters. Sparkling Blue Topaz and London briolettes sit on top of 18x14mm Fresh Water Pearls hand knotted on blue thread with a 14k Gold filled sheppard. Total Earring length 63mm.